AFTER TASTING defeat against the Wallabies last weekend in Perth, Heyneke Meyer has made two changes to the Springbok team who face New Zealand in the fourth Test in The Championship in Dunedin on Saturday. Both changes are in the forwards, where lock Flip van der Merwe replaces the suspended Eben Etzebeth while Francois Louw comes in for Marcell Coetzee at flank. There are four more changes on the bench, where Coetzee joins Dean Greyling, Andries Bekker and Juan de Jongh amongst the replacements. “The New Zealanders are good on the ground which is why we decided to go for a specialist openside flank in Francois,” said Springbok coach Heyneke Meyer. 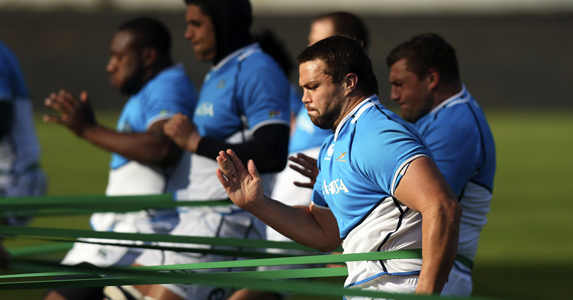 Jannie du Plessis has been named at tighthead prop despite struggling with a hamstring niggle. Meyer said the Springboks’ medical team is working very hard on the injured players and that Du Plessis will be given until Friday to fully shake off his injury, but if he fails to recover in time, Pat Cilliers will start in the No 3-shirt. “We will not take any chances with injured players and we have time to get him and Pat (Cilliers) match ready,” said Meyer. Greyling will be on the bench to provide prop cover, while Bekker takes over from Van der Merwe in the No 18 shirt. De Jongh comes in for Lwazi Mvovo on the bench. Fun Fact: The Springboks’ starting XV have a combined total of 482 Test caps – 136 in the forwards and 346 in the backline.